If you know me, you know that I love chicken. I actually have a designated day of the week that I always grill chicken…Chicken Monday! The thing I enjoy most about chicken is its versatility and ease of preparation. 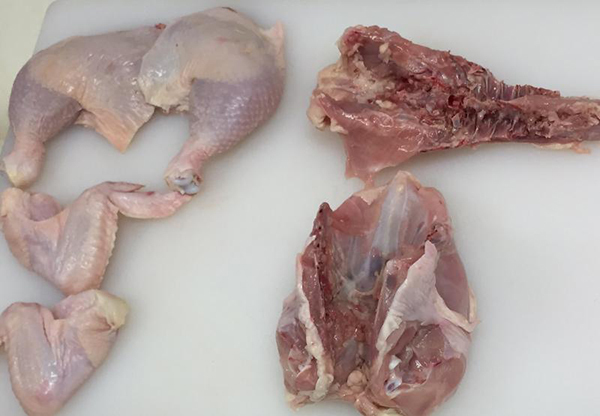 At my butcher shop, we only sell fresh all natural whole chickens that are raised on a vegetarian diet without antibiotics or added hormones. The ideal size for a whole chicken is 3 ½ to 4lbs. 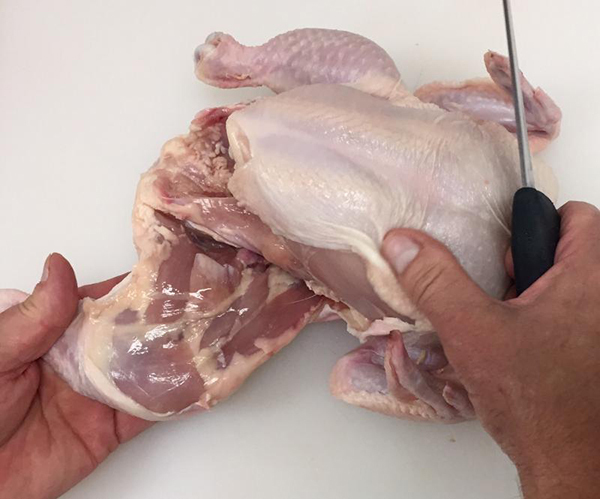 To cut chicken, you will need a few things: a cutting board, kitchen shears, and a sharp knife. 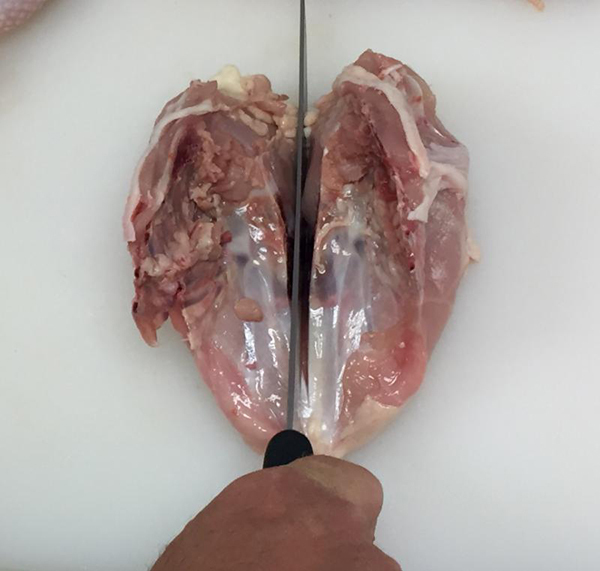 The first step in cutting up a chicken is to lay it on the cutting board breast side up. Tug the legs away from the breast and cut the skin between the leg and breast. The leg will fall away from the bird exposing the joint. Cut through the joint separating the leg from the backbone; repeat on the other side. Next, flip the bird over so the breast is down. 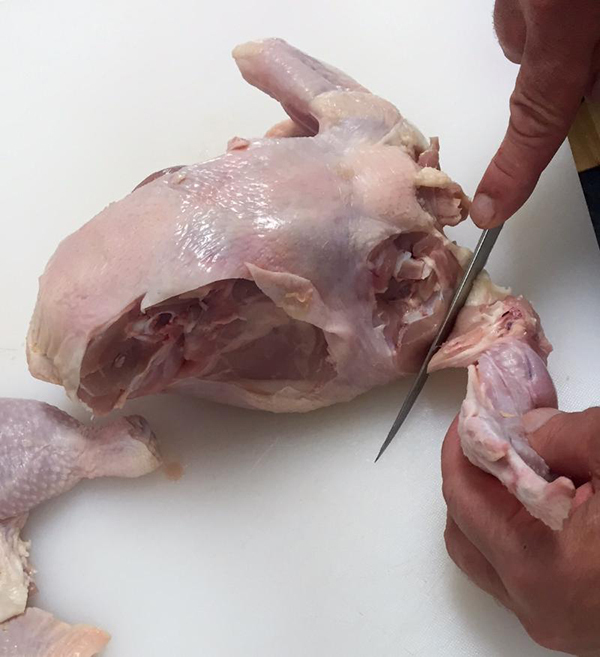 Make an incision that exposes the joint where the wing attaches to the breast. Cut through the joint and the wing is off; repeat on the other side. Now, starting at the neck with your kitchen shears, cut along one side of the backbone, then the other side. The wide back is off. You now have two legs, two wings, one whole breast, and a wide back. The next step is to cut the breast in half using a sharp knife, then trim off the wing tips at the joint. 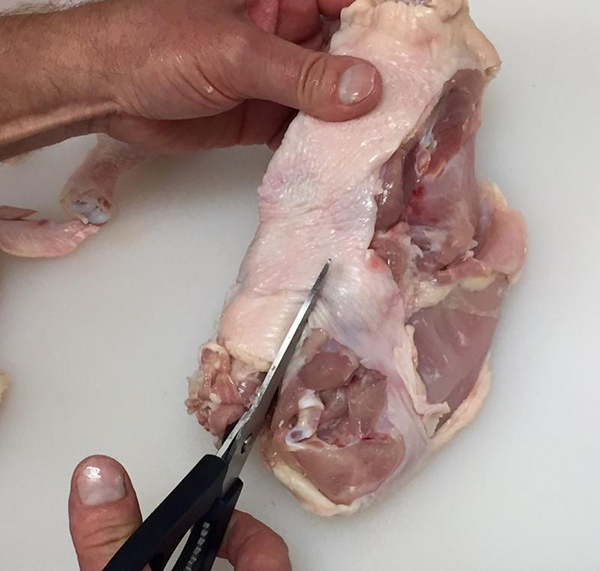 Grab the legs and cut the thigh off the drumstick at the joint; there is a line of fat between the drumstick and thigh. That’s your spot. BAM!!! You just cut up a chicken that this butcher would be proud of!!! There are benefits to cutting up a whole chicken on your own. It will save you money, as it is less expensive per pound to buy a whole chicken than individual parts. You will be a rock star to your family and friends when cutting up a chicken on your own!! You’ll also have that nice wide back and wing tips to make some tasty stock!!! Don’t be intimated by that bird, you can do this!! !